The Woolshed Cabins are located four kilometres from Beechworth in the historical Woolshed Valley. 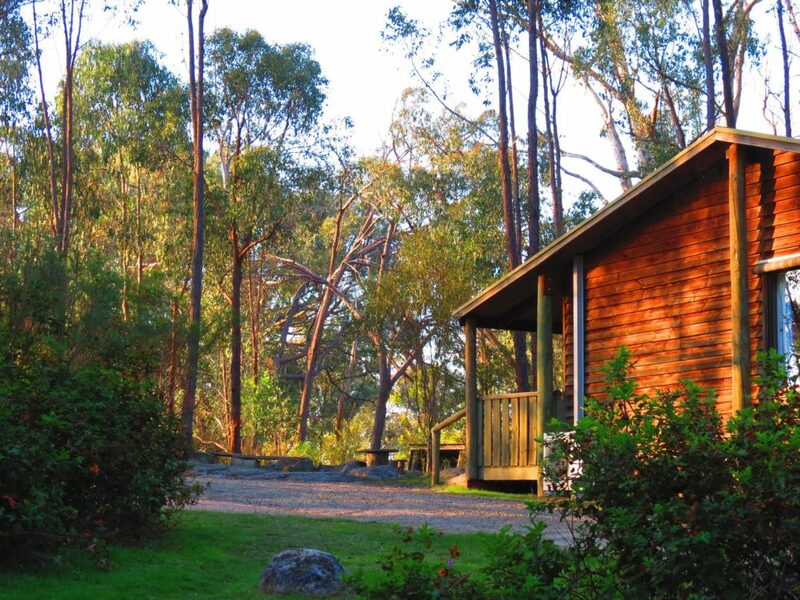 Situated on 12 privately owned acres of Australian bushland, there are four individual, two bedroom self contained cabins, sleeping up to five people. All are within walking distance to the majestic Woolshed Falls. Come for a relaxing digital detox or enjoy the outdoors bushwalking, cycling or birdwatching. Open plan cabin designed to feel like your connected with the nature outside your window, the king bed is the main focus of this cabin which is open, bright and airy. An enclosed second bedroom consists of single beds. Full kitchen with retro dining, lounge television and DVD player, reverse-cycle air conditioning will keep you cool or warm. Classic corrugated iron themed cabin. Featuring queen beds in both bedrooms with a trundle option for junior, shared bathroom. Perfect for one or two couples. Open, spacious, earthy and light. Full kitchen, retro dining, large lounge room, television and DVD player, mini sound system with bluetooth/USB, modern lighting, reverse cycle air-conditioning and a comfy verandah to relax on. Designed for two couples, queens bed in each bedroom plus a sofa bed if needed. Full kitchen, large fridge, micro-wave, retro dining, lounge room, television and DVD player with bluetooth sound system, reverse cycle air-conditioning and a comfy enclosed verandah. North facing country charm cabin with easy ramp access, Queen bed in main open plan room and single bunks in the second bedroom, trundle available for juniors. Full kitchen, large fridge, retro dining, lounge room, television, with mini sound system with bluetooth/USB/DVD. Reverse-cycle air will keep you cool or warm. Comfortable verandah with a fire pit out front to roast marshmallows. Fire pit only available March to November.